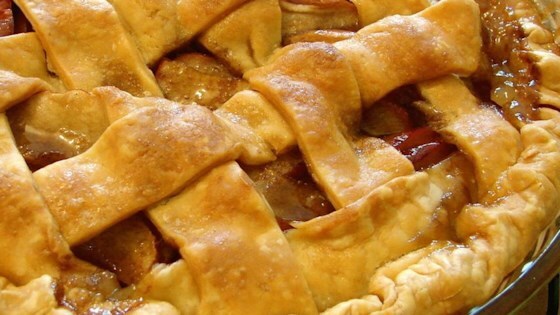 "To me, this is the purest and most intensely flavored apple pie recipe there is. The interesting thing about this recipe is the way the caramel sauce is poured over the apples and the lattice crust. You know how with a traditional apple pie some of the apple juices will caramelize as it bakes and bubble out of the pie and bake into and onto the flaky crust? That's how this whole pie is." Combine butter, white sugar, brown sugar, water, cinnamon, and salt in a saucepan over medium heat. Bring to a boil, remove from heat and set aside. Roll out half the pastry to fit a 9-inch pie plate. Place bottom crust in pie plate; pour in apple slices. Roll out top crust into a 10-inch circle. Cut into 8 (1-inch) wide strips with a sharp paring knife or pastry wheel. Weave the pastry strips, one at a time, into a lattice pattern. Fold the ends of the lattice strips under the edge of the bottom crust and crimp to seal. Pour butter-sugar mixture over top of pie, coating the lattice, and allowing any remaining sauce to drizzle through the crust. Bake in the preheated oven for 15 minutes. Reduce heat to 350 degrees F (175 degrees C), and bake until the crust is golden brown, the caramel on the top crust is set, and the apple filling is bubbling, 35 to 40 more minutes. Allow to cool completely before slicing. Learn how to make Chef John’s favorite apple pie recipe. Get the recipe for Chef John's Easy Homemade Pie Crust.